The General Options tab is the first area to set up on your payment page builder. Below will reflect what is available and how to use it. Enter in the Page Name to be used for your reference. Confirm your Page Type of either Payment or Donations. 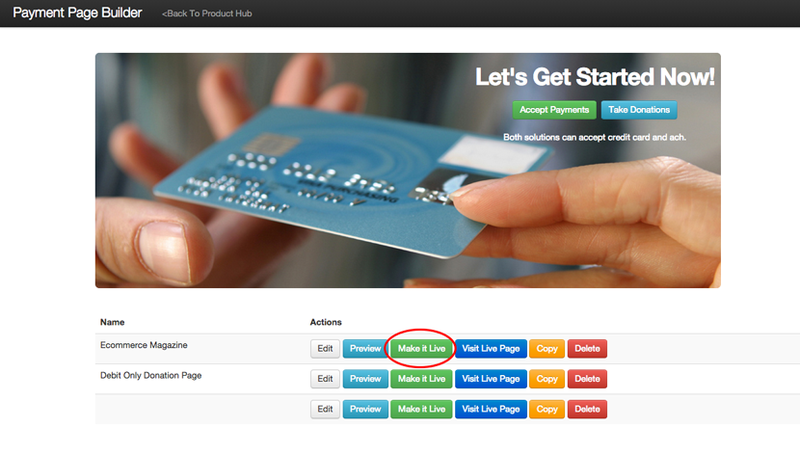 Payment Page: will allow customers to designate the amount they will pay. 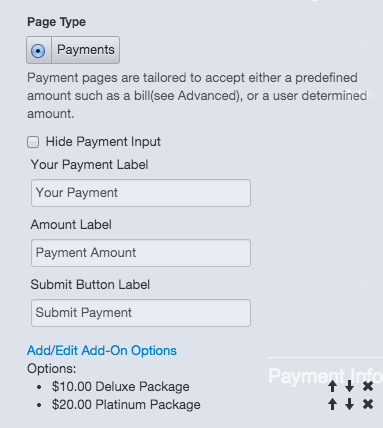 You can also configure a Payment Page to have a preset amount to be paid (see this article), and include add-on options that add an additional cost to the original amount. To define Add-On Options, click Add/Edit Add-On Options, and fill in the options in the popup box. Donation Page: will allow you to add preset amounts with a description next to each. Up to 15 preset amounts can be added. The placement of each amount can be changed to either vertical or horizontal. Single Page: checkout page only. If you'd like your customers to be redirected to an external receipt page, enter the URL in the box labeled "URL for Receipt". Configure your Payment Details. The credit card account should be set to the merchant account you wish to use your page with. Also, be sure to designate whether you wish to accept eChecks with an ACH account. If there is a minimum amount you accept, designate that in the Minimum Amount Accepted textbox. All messages are optional. You may use the editor to format text, add images & links, and create tables. Add an Introduction Message to be shown on the checkout page. Add an Approval Message to be shown on the result page. Add a Decline Message to show on the result page. Image: You can add an image by browsing for a file from your computer that is 25 MB or under. The appearance can be modified by using alignment, dimensions and advanced options as well. 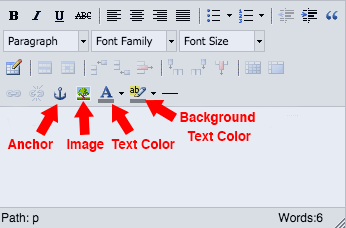 Text Color: If you click on the "A" it will bring up a color palette for your selection. Background Text Color: When clicking on the highlighter it will bring up a color pallette for your selection. NOTE: When highlighting your mouse over the icon, it will reflect the icon description. Send Receipt on Approval (if you select this, enter the following for the Receipt Email under Custom Email Text: Subject, Top Message, and Bottom Message. This area allows you to give your customers payment or donation options to have a certain amount deducted from their account on a frequency. If "one time" is the only option selected, the customer will not have the ability to select multiple payments. If "one time" and other options are selected, the customer will have the ability to choose if they want to have an amount deducted on a frequency or not. If "one time" is not selected then the customer will only be billed on the frequency they select, and cannot make a one-time payment. The Recurring Frequency Plans will give you the ability to provide your customers with even more recurring options if you wish to do so. If "Until Cancelled" is checked, your customer will be charged on the same frequency until they contact you to cancel their payments. 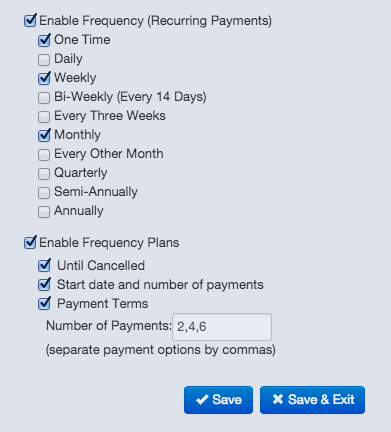 Payment Terms provide you with the ability to add the number of payments in the selected frequency. For example: If monthly is selected and the payment terms are set to 2, 4 and 6 payments, the customer will have the ability to select whether to be billed monthly for 2, 4 or 6 payments. NOTE: The dropdown box will only show the payment terms in the preview screen and not the store builder. When you are finished configuring your payment page, click Save or Save & Exit if you'd like to exit the Payment Page Builder. You may edit these settings at any time.